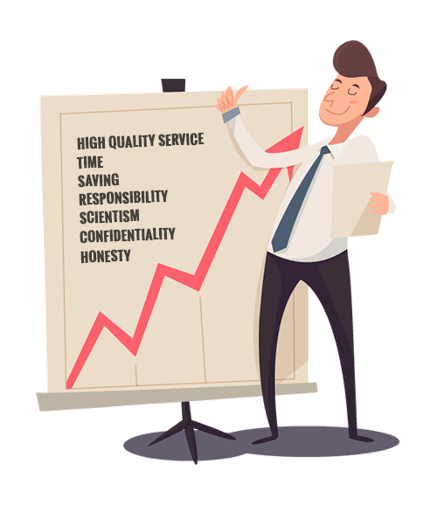 HIGH QUALITY SERVICE: Quality is an indispensable element of our lives for our personal and corporate development and the most important value of our corporate culture. Our clients ascertain the criteria about our quality. Part of our quality perception is 100% appropriate and 100% on time delivery. The second part of our 'high quality services' understanding is our after sales approach. Please read the detailed explanation of our quality criteria in the following section. TIME: Each person in Referans Translation Services is conscious that time is an important asset for which we do not have an 'undo'. Therefore, Referans Translation Services has committed to timely deliveries. Our management takes any measures to enable the whole staff to work in full capacity without any idle times. SAVING: The most convenient way of earning is the saving the sources you already have. With this main principle consciousness, Referans Translations on one hand keeps the operational costs at reasonable levels and on the other hand it has established attention drawing applications for its customers to ensure budget savings. RESPONSIBILITY: Each employee involved in a project is well aware about the fact that their responsibilities regarding the services rendered still continue even after the delivery and that they still can contribute the same at any step in the future. SCIENTISM: We always apply scientific approaches in order to provide objectivity and customized consistency. All the work done is kept in customer specific TMs and used for the purpose of our clients profitability and efficiency. CONFIDENTIALITY: All our staff and all the freelancers we work with have signed an NDA for the confidential handling of all content regardless the same has a legal or technical, etc. nature. HONESTY: We believe honesty is not an additional fact to be proud of but a natural duty for all professionals. We stay away from any behaviors that may be harmful for our customers interests.